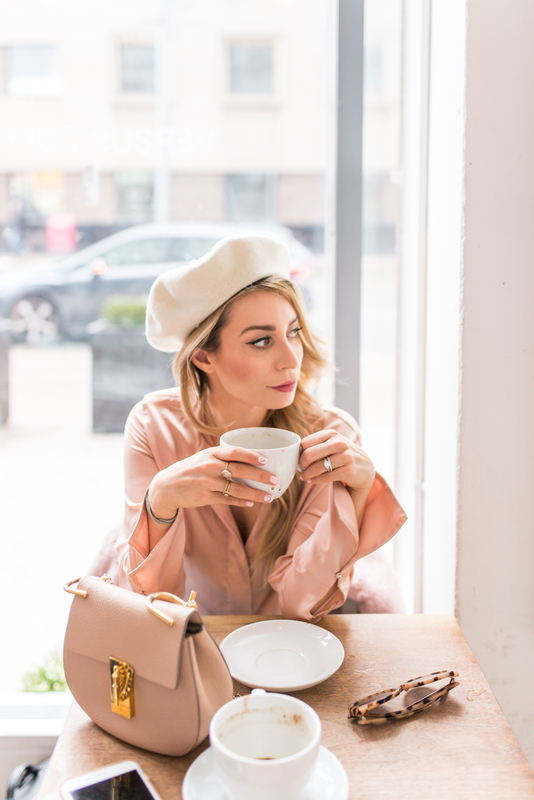 OOTD - The Pink Coat Obsession Continues | La Petite Noob | A Toronto-Based Fashion and Lifestyle Blog. It's been a minute since I've done a good, old fashioned outfit post so over the weekend I got dressed up in my Sunday best, grabbed my camera and a reluctant Brian and took some outfit photos. If you guys watched my newest Youtube video, you would have seen that I picked up this fuzzy pink coat from the Zara sale. I need another pink faux-fur coat like I need a hole in the head, but this coat is honestly everything and the one that I have been reaching for me most. I love dressing it up like I did in these photos; paired with a sweater dress, some over-the-knee boots and a white beret. Later that night, we drove over to my parents house for dinner and it looked just as good worn with black skinny jeans, booties and an oversized sweater. Check out my video to see what else I scored from the Zara sale! What do you guys think? Is there an item in your closet that you just can't stop buying? Have you jumped on the giant faux-fur coat trend? Let me know! Yay! Love the coat, obvi! And what a perfect outfit for yesterday's milder temps. Oh my!! How wonderful and so Parisienne chic you look like here?! SO gorgeous! Girl you are just the cutest! I love that coffee shop shot, and your fuzzy coat is SO pretty!! Gorgeous outfit! This color looks great on you. Blush is the new neutral, this color is very flattering on blondes as well as brunettes. I enjoy your blog very much, I am very petite myself, only 4'11". Thanks so much for sharing!